Boldenone Undecylenate: Should Women Use this Steroid? Anabolic steroids are always a touchy subject in the bodybuilding world. We know they are widely used by athletes and bodybuilders. The issue is that anabolic steroids have a much different effect on women then they do on men. In this article, I will discuss the benefits and side effects of Equipoise (Boldenone Undecylenate) can have on women. Anabolic steroids have a long history of helping athletes improve performance. Anabolic steroids can be traced as far back as the early 1930s. They have been used in the treatment of several health conditions to prevent muscle wasting diseases caused by cancer and AIDS. Anabolic steroids can help contribute to an increase in body weight when used with proper diet and nutrition. People suffering from muscle wasting diseases will see increased strength benefits which can often help them better fight off the disease while undergoing medical treatment. While we know that anabolic Steroids are popular among male bodybuilders. The primary hormone in men is testosterone, taking anabolic steroids can help men easily gain muscle mass and increase strength. Unfortunately, very few anabolic steroids are female friendly. Women who take anabolic steroids end up suffering from harsh side effects. These side effects are known as virilization which is caused by an increase in testosterone. Women who take steroids will begin to notice an increase in testosterone if taken for a long time, women will begin to suffer from symptoms of masculinization. Basically, their body begins to transform into a man. Some of the most obvious symptoms are deepening of the voice, clitoral enlargement, excess body hair, and hair loss. When you see women with huge muscles and a deep voice it is most likely due to long-term steroid use. Equipoise (Boldenone Undecylenate) is a steroid that has been used by female bodybuilders due to its lower side effects, however, this does not make it a perfect steroid for women. Equipoise goes by the name Boldenone Undecylenate, it was developed by CIBA for veterinary use. It was used to treat illness in cattle and horses. The first doses suited for human use surfaced in the early 1950s, it was sold under the name Parenabol. While the steroid did enjoy a brief success in human medicine it was discontinued in the late 1970s. Since then Boldenone Undecylenate has only been sold for veterinary use. Fort Dodge Animal health currently owns the Equipoise name. While other Pharmaceutical companies have sold Boldenone it has become more and more scarce. Most bodybuilders who obtain Equipose end up buying it from underground or black market pharmaceuticals. Some have compared Equipoise to Deca Durabolin, the truth is it is not the same. The characteristics of Deca seem similar to Equipoise, the difference is, oral Deca Durabolin is a 17AA hormone and the half-life is only 8 hours. Equipoise has a long undecylenate chain attached with a half-life of up to 15 days. 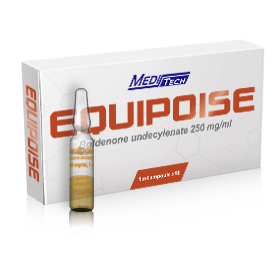 Equipoise (Boldenone Undecylenate) is an altered form of testosterone. The chemical alteration lowers the androgenic potency making Equipoise a milder androgenic. Boldenone is attached to an undecylenate ester, the release of the hormone is very slow, it usually takes 4-5 days for peak release after the substance has been injected. A slow and continuous release can last anywhere between 15-20 days. Women may choose to use Equipoise due to its low androgenic traits. The benefits of Equipoise in women include increased protein synthesis, improved nitrogen retention in the muscles and an increase in the IGF-1 hormone. Many women who take Equipoise also notice a significant increase in strength. A low dose of Equipoise over a short period of time (no more than 8 weeks) is usually well tolerated by women. Women who are looking for a moderate increase in muscle mass while eliminating body fat will find that Equipoise is an ideal steroid. Taking Equipoise during the offseason with a good meal plan is a good way to increase lean muscle. Equipoise can be used during a cutting cycle, one of the best traits of Equipoise is its ability to help maintain lean muscle when cutting back on calories. In order to eliminate body fat, you need to burn off more calories than you are consuming. Dieting down and eliminating calories in an attempt to eliminate body fat can put lean muscle at risk. A good diet while taking Equipoise can prevent muscle loss during a cutting cycle. Equipoise is very well tolerated by men and it is one of the few steroids that seems to be tolerated almost equally by women. The side effects for women are well tolerated when taken in low doses. Equipoise is androgenic so higher doses can cause virilization. The biggest problem women will find when taking Equipoise is that since it is slow acting, the symptoms of virilization will take some time to show up. Women who take Equipoise and begin to notice symptoms of virilization should immediately suspend use and wait for the symptoms to subside which will usually take about 2 weeks. Due to the extended chain bond in Equipois, it can be detected in drug tests long after you stop using it. On average it can be detected for at least 5 months, in rare cases up to 18 months. This is one reason many athletes avoid taking Equipoise. If you are a pro athlete or bodybuilder who is exposed to frequent anti-doping tests you will probably want to avoid Equipoise altogether. For women, the recommended dose of Equipoise is 50mg per week, however, a lot depends on sensitivity to the steroid. Some women have been able to tolerate doses of 75-100mg per week. Women should not cycle for more than a 6 week period anything longer may cause unwanted virilization effects. Genuine Equipoise is becoming harder and harder Boldenone Undecylenateto find. If you do find it you should be very skeptical about the substance you are buying. Equipoise is generally found online from underground labs or black market sellers so it’s hard to tell if you are getting a legitimate product. Many sites that claim they sell genuine Equipoise are actually selling Primobolan at 3 times the price. While Equipoise is considered a mild steroid, in our opinion, it has more cons than pros, it does not have as many side effects but if used for prolonged periods can cause symptoms of virilization. Women who are serious about training are far better off using a natural anabolic alternative for the simple reason that it will have similar benefits of an anabolic steroid without having to worry about issues with virilization affecting your health.